Jacob Bowling, 12, poses by his locker on his first day of middle school. 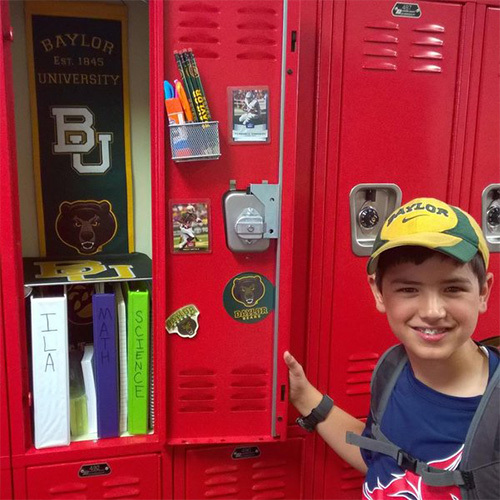 After years of waiting to have his own locker to personalize, Jacob had one color scheme in mind--green and gold. Jacob also displays his Bear pride by wearing a Baylor shirt to school every day and on the weekends, with exceptions made for middle school spirit days and when playing a team sport. When possible, Jacob sports his autographed Baylor hat. Jacob's parents, Kevin Bowling, BBA '98, MACC '99, and Amy Bowling, BSE '98, are avid Baylor fans and football season ticket holders for the family of five. "Jacob was #BaylorProud from birth, and he attended his first football game at the age of two months," Amy said. "'Sic 'em, Bears!' were among his first words."